Jailhouse Lawyer gets in on the island quiz act too. The English teacher said that no man is an island. I replied, save for the Isle of Man. Very good, said the English teacher. I have since found another example. Can you guess what it is? I am thinking of a specific example. Therefore, does John Johnson ring any bells? Let me see - Johnson, bells. Something maybe in the Thames. Hmmmm. James: There is a London connection. But, there are others. We're speaking of an island, right? James: "The Cat, the Rat and Lovel our Dog, Rule all England under a Hog". This satirical rhyme is about the father who's son is connected with the man John Johnson which is not his real name. William Collingbourne, yes but can't see the island unless it's Britain itself and bell is for the cat. 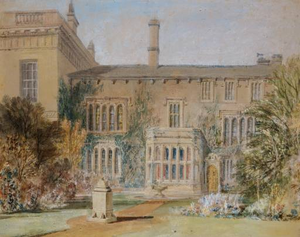 The photo of the picture features Farnley Hall. Guy Fawkes. Right. Now for the island in London. This one's a puzzler. Not London but Guy Fawkes Island in the Galápagos Islands? Bingo. Guy Fawkes is a man. And the island was named after him.